Earth is made of rock, from the tallest mountains to the floor of the deepest ocean, with thousands of different types gracing the planet. Most rocks at Earth’s surface are formed from only eight elements—oxygen, silicon, aluminum, iron, magnesium, calcium, potassium, and sodium. But, what is unique, is that all of these elements combine in a number of ways to create rocks that are all very different. From talcum powder to silver jewelry to the stone we build our homes with, it all comes from inside this great big rock we live on. When you chat with Bill Carter, you quickly find out that he’s all about rock. Lots of rock. Carter and his partner, Brad Mercord, own Montana Rockworks, located in Kalispell, Montana, just a stone’s throw from Glacier National Park. 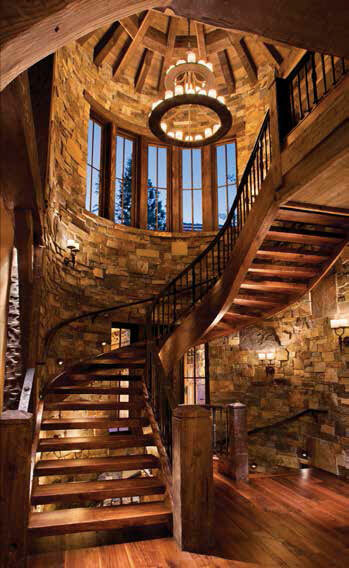 Rockworks specializes in architectural and landscape stone, and is the largest supplier in the region, offering their clients the oldest and most beautiful stone in the industry—stone that is only found in Rockworks’ quarries. 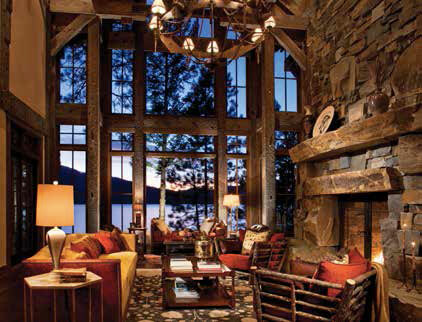 They help homeowners, architects, and contractors bring the majestic beauty of the Rocky Mountains into their homes, designs, and building projects. After a few minutes chatting about their thriving business, Bill turns into a rock hound, explaining enthusiastically, “You know, we quarry all our stone right here in the Montana Rockies.” I was almost expecting to hear, “Hi, my name is Bill, and I’m a rockaholic.” But very quickly, Carter had me fascinated, staring at amazing shapes, color, and textures of, yes, rock. 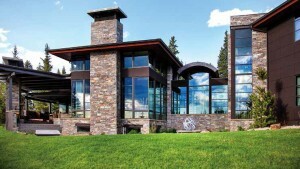 Montana Rockworks was formed over a decade ago, when Carter’s partner Brad Mercord’s thriving specialty-stone landscaping firm one day outpaced production capabilities at the local quarry, right in the middle of an upscale project. 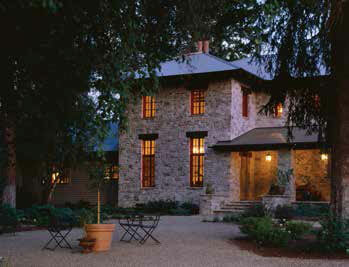 So, Brad and Bill bought the local quarry, upgraded it, and finished the job. 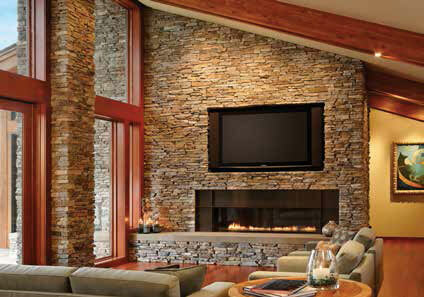 Natural stone is a very low-maintenance veneer. 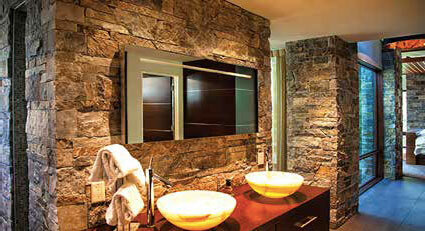 Once the material is completely installed, little else is needed to maintain the stone through the years. 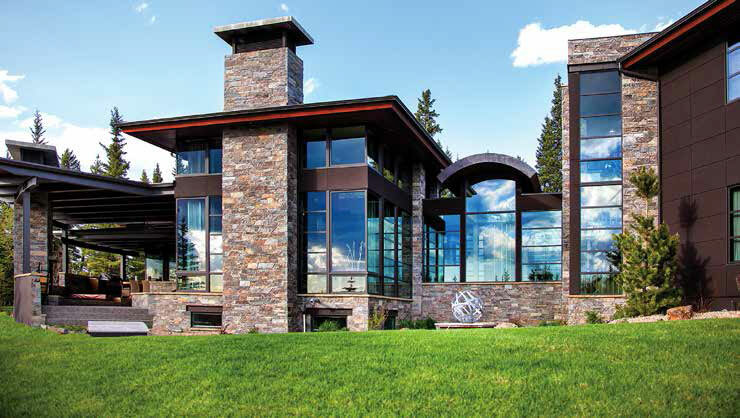 From the heart of the Northern Rockies to their network of quarries nationwide, Rockworks is able to supply a large variety of stone for any type of architectural or landscape project. The benefit of all the rock they quarry is that it’s produced primarily in a linear/rectangular shape. 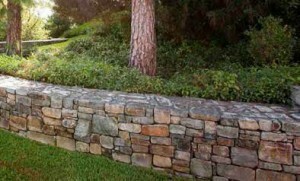 This makes it a great option for building walls with structural integrity, both dry stack and masonry. Stone from Rockworks’ Moose Mountain quarry is from a formation, and this rock is grounded in a dark, smoky gray, with dark chocolate brown and tans that blend together for a remarkable material. Other choices include Montana Antique, a perfect pick for those wanting to achieve the look of the old west, or Autumn Gold, a stunning combination of golds, tans, and greys with splashes of copper throughout, or Echo Valley, a striated stone with long lineal lines, predominately grey with subtle brown and beige tones throughout. Bill Carter and his team’s intent is to help his clients achieve a lasting impression. “It’s not a necessity to build with rock,” says Carter, “but everyone can, and it’s affordable at every level. It’s a beautiful aesthetic where it’s all about colors, textures, and shapes. It’s art.” Spoken like a true rock star. For more information, call Montana Rockworks at 406.752.7625 or visit www.montanarockworks.com.